Hi friends! Quick card to share with you today on this last day of Sale-A-Bration! I'm in need of birthday cards and ideas for a class that I have coming up real soon so I thought I would get started. Today I used Daydream Medallions and Perfectly Penned to created a fun birthday card...well I think it's fun, I also threw in some Sunshine & Sprinkles Designer Series Paper that really added to the fun factor! Here's what I came up with. Daydream Medallions was stamped on Pool Party card stock and then I used the Big Shot and the Floral Frames Framelits to cut out the images. 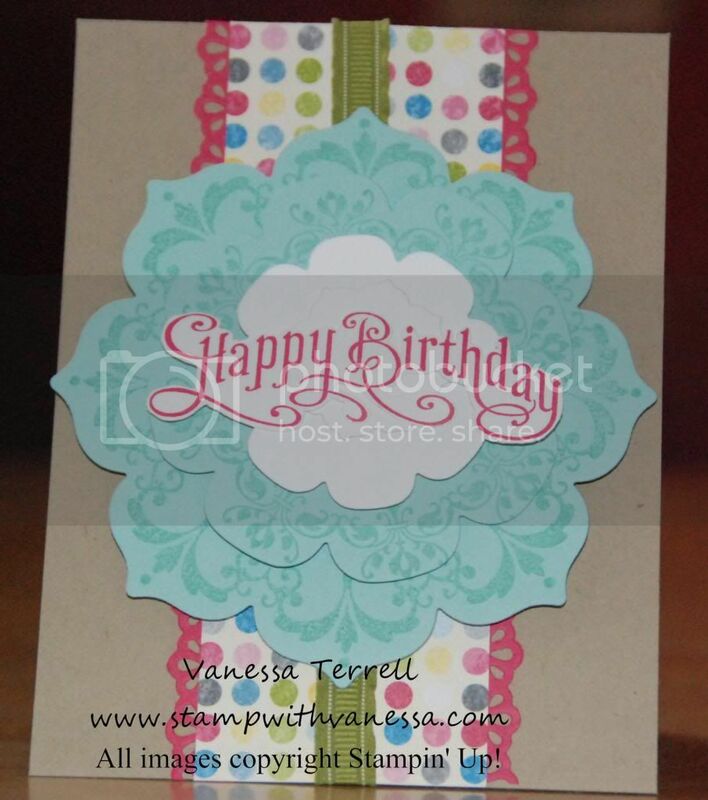 I stamped the happy birthday in Melon Mambo from Perfectly Penned and cut it out using my paper snips.